So we have had a pretty mild summer, however with it being a bit dryer these last few weeks your lawn will show certain signs that your system may not be up to par. Since many systems run in the early morning hours and you arent usually awake to visually inspect the system, here are some signs that you may have issues that you can spot without seeing the lawn sprinkler system run. Do you notice bright green spots where the grass seems to grow much faster than the rest of the yard? Usually this is do to seals that have failed on your sprinkler heads which can waste a considerable ammount of water. It could also be that over time the heads have settled and are now too low to water your lawn evenly. Either way it causes water to pool around the sprinkler heads causing these bright green circles. Another dead giveaway of an issue would be when you notice a long bright green strip surrounded by grass that seems to be less healthy (yellowing or brown grass). This is what happens when the gears in your larger sprinkler heads, a.k.a. rotors, have stripped and the head is no longer rotating. Do you have entire sections of grass in your lawn that seem stressed or not as green as other areas? 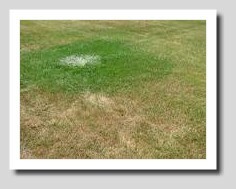 This could be due to a valve failing, causing an entire section of your lawn not to get water. Is there an area of your lawn that never dries out and is always soaking wet when you mow? This can be due to the valves failing and not shutting off completely allowing water to constantly flow from the lowest point in elevation on that particular zone. A good way to be certain is to make sure all water using devices inside are shut off, then go watch your water meter. There will be a small dial that will rotate with the smallest ammount of water being used. Regardless of the issue, Midwest Sprinkler Service and Sales can diagnose and correct the issue just as fast as you were able to read this, and have you back on track to having the greenest lawn in the neighborhood!